These are a favorite appetizer around my parts...although they are called something a little less politically correct. Regardless, they are delicious and never last. Remove the slices of beef and separate them. Pat them dry. Spread a layer of cream cheese on a slice of beef. If you are using a whole pickle, simply roll the slice of beef around the pickle and secure with a tooth pick. Using pickle slices, line them along to cover about 3/4 of the slice of beef. Starting at the pickle side, start rolling and secure with a tooth pick. Arrange on a plate and stick in the freezer for about 10 minutes. This will help cut the rolls into bite size pieces. Follow recipe 1 but add 2 Tablespoons sour cream to the cream cheese and mix well. The most time friendly out of the bunch. 2 T. sour cream or enough to make the cream cheese creamy. Mix all of the ingredients together and eat with crackers. Feel free to experiment. You can add hot pickles, extra dill, or even try ham or turkey. The possibilities are endless but I promise they will be a hit. 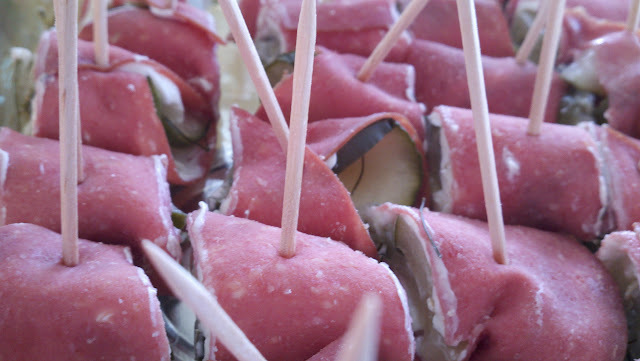 I'll have to try them since I love corned beef, cream cheese and pickles! I bet this would be good with roasted red peppers added in the mix too. Yum. I've always wanted to make these. Will have to add these to the snacks on Christmas Eve. Yum!